FYI- $40 rebate on Pirelli's at JakeWilson.com. Good time to get those Angel GT's (regular or A-spec)! The rebate is national, not just through Jake Wilson. I did find that Jake W was almost 60$ cheaper than Revzilla, so I had them price match for me and bought one set from each! Now I'm gonna get 80$ back! woohoo! Thanks Matt, good to know!! I only mentioned JakeWilson as it was cheaper for tires compared to the other stores, but if others will price match like Revzilla, I would use them. I prefer Revzilla as they tend to do better prices overall and more parts/accessories plus their zillacash helps too. Thanks for the tip on the rebate guys...just picked up a set of Pirelli GT's (A Spec) with the rear being a 55 and only paid $299 at Jake Wilson! After the $40 rebate, that brings it down to $259. A steal in my opinion for GT's!! This is why I love this forum!! "Why is there never enough time to do it right the first time, but always enough time to do it over?" I just took advantage of this. Upgraded to a /55 aspect ratio for $300, minus rebate for a grand total of $260. Took my Battleaxis's off with 1000 miles on them, sold on eBay for $120 (some people will buy anything, even crap tires). Effective grand total to get out off of crap tires and improve turn-in? $140...man's gotta be crazy not to do that. Had mine delivered to my friends house in Milwaukee. What a deal, $299, plus $40 rebate and a 600mi round trip to his place to put em on and do the TPMS batteries. That's a good way to go! Of course me, I'm hard headed! On my Angel GT (A Spec's 55's) now! I couldn't resist, and I'll be needing new ones soon. I have about 2000 miles on mine, and could NOT be happier with the performance, stick, handling, and wear. I cannot get these things to break traction in the wet OR dry. I'll be buying these again! VISA card for rebate came in the mail today. Card activated, $40 balance. Also, I recently got an email from Jake Wilson indicating I have a $38 credit there. ~2,000 miles on the tires now with no complaints. Same for me, came in the mail this weekend and have a $39.99 credit at JW. The tires have been fantastic so far. Metzeler has a $50 rebate on the Roadtec O1 until August, so if I use all the rebate money the front and rear should be about $210, may have to give them a try! This tire rebate paid off in a couple ways. 1. Reduced cost of original tire purchase. 2. Reduced cost of the next item purchased. I just redeemed the rewards credit $ on a new battery. I'm due up a new set soon, so I'm glad Pirelli has this similar offer again. Going to go with JakeWilson this time around just to see what delivery times are. So far the A specs are fantastic all-around but especially in the twisty curves and long lasting! Coupled with SiSF's flash it makes the miles and season go too fast! at one time bikebandit price-matched jakewilson for me + extra 10% off. Like they won't do so with the rebate but who know. worth asking if in the market for tire(s). Ordered my tires over a month ago, got confirmation that my rebate had been processed from JW, and STILL haven't seen my rebate card?! How long did YOURS take to arrive?? I ordered a front angel gt a spec today, Jake Wilson also has a rewards program which saved me 18 dollars off the top. So the tire cost me a little over $ 116 in change. But right now i"m still running a Bridgestone evo gt and have around 13k on it. i already have an angel gt a spec on the rear. loving it so far. Finally got my rebate card from Pirelli. I chose the Debit Card option. Took every bit of the 8 weeks to get processed, but I was pleased to have it! This is now my 2nd set of SpecA's, and I'll continue to buy them for this bike. 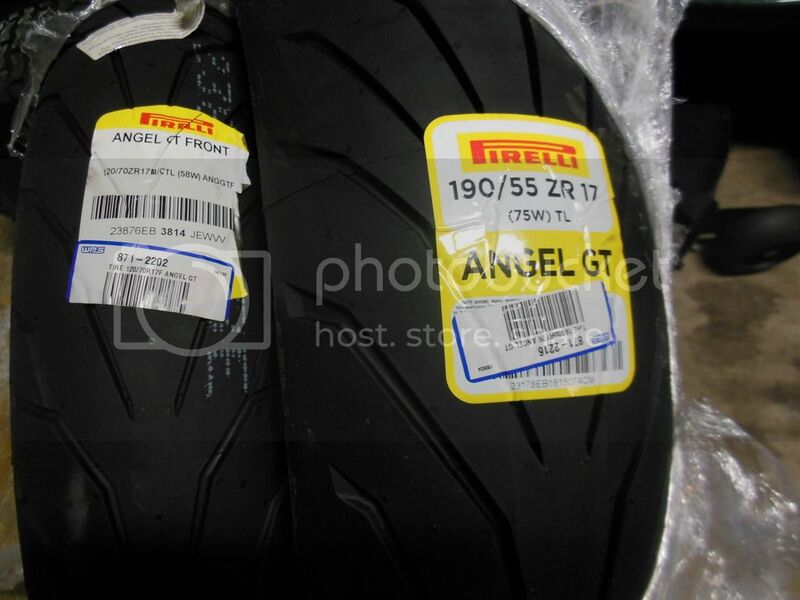 Angel GT's on my Aprilia Falco as well. I'm a fan.